Active oxygen content: 9.45%. Decomposing temp.& Half-Iife period:1 min. when temp. 182'C; 10hrs. when temp. 118-120'C. 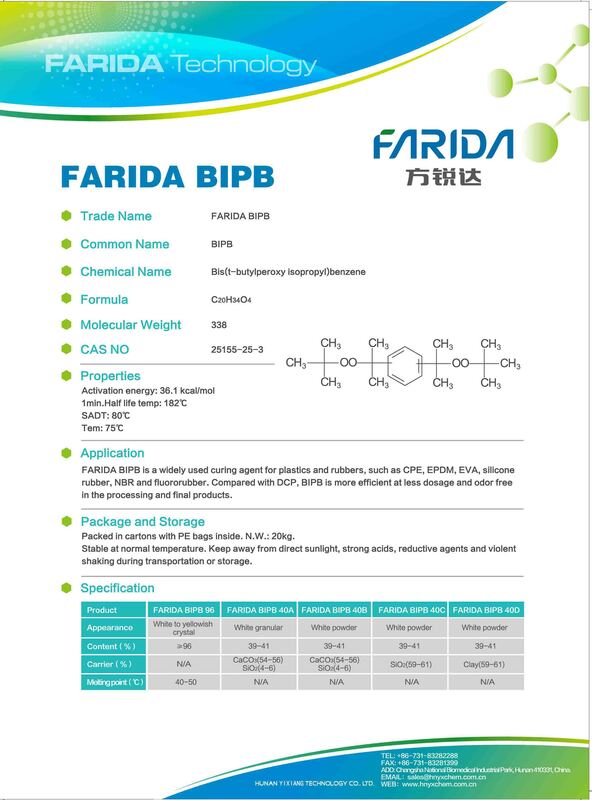 Usage: FARIDA BIPB is a widely used curing agent for plastics and rubbers, such as CPE, EPDM, EVA, silicone rubber, NBR and fluorubber. Compared with DCP, BIPB is more efficient at less dosage and odor free in the processing and final products. Packed in cartons with PE bags inside. N.W.:20kg. Stable at normal temperature. Keep away from direct sunlight, strong acids, reductive agents and violent shaking during transportation or storage.